Buddhism as a religion has a long and varied history, with some fascinating tenets and a following of over 350m. 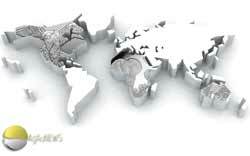 With the religion being based, and very popular in Asia, a region in which collecting gold and silver coins is common, it was only a matter of time before the two combined. 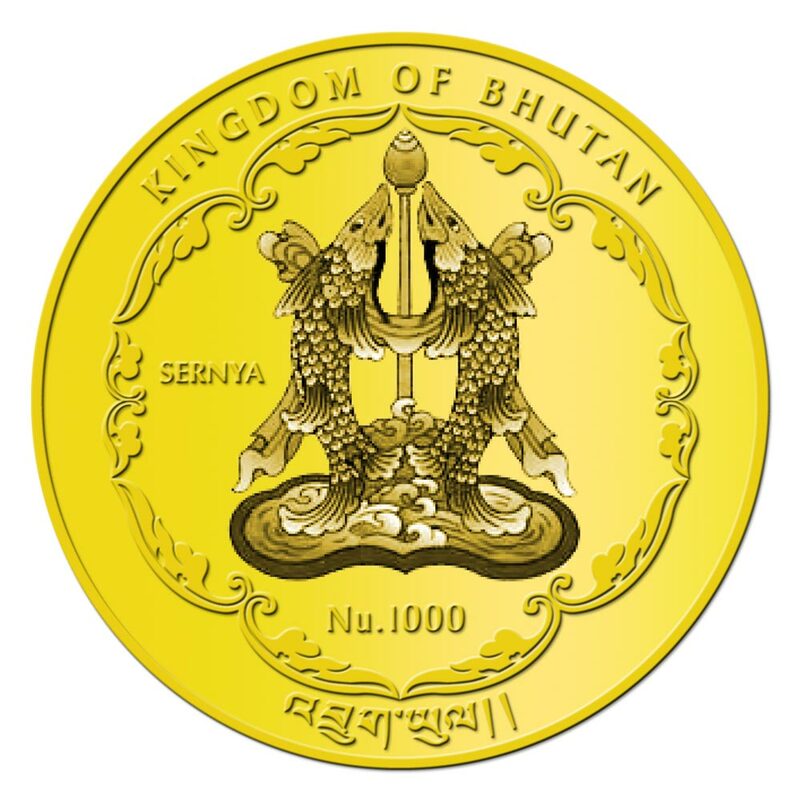 The coins each have upon their reverse a symbol representing one of the “Eight Auspicious Symbols”, also known as “Tashi Tagay”, which form the most well-known group of Buddhist emblems and are quite prolific in Bhutanese tradition and culture. They are believed to bring good luck and fortune to self, family and the nation and are found displayed, carved and painted on walls all over Bhutan. 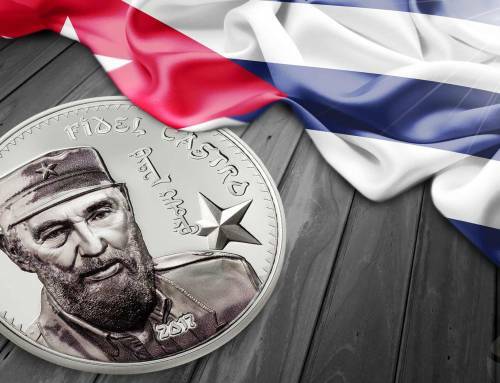 The obverse of each coin showcases one of the many famous statues and monuments that are associated with the worlds fastest growing religion, along with the country in which it is found. 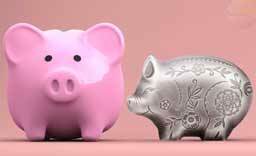 When released in 2010, the coins were available in three formats; a 1oz 0.999 silver coin, a ¼oz 0.9999 gold coin, and a 1/25oz 0.9999 gold coin. 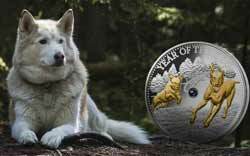 From 2012 onwards, the 1/25oz gold coin were dropped and the release schedule dropped from two per year to just one. 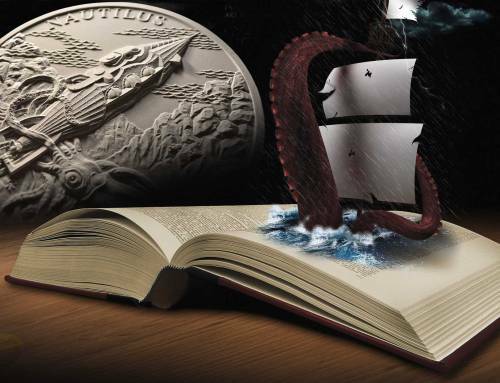 With the release of the ultra-high relief 2015 coin, the eight coin series has concluded and the mint released some themed display frames to hold the set, one for gold and one for silver. 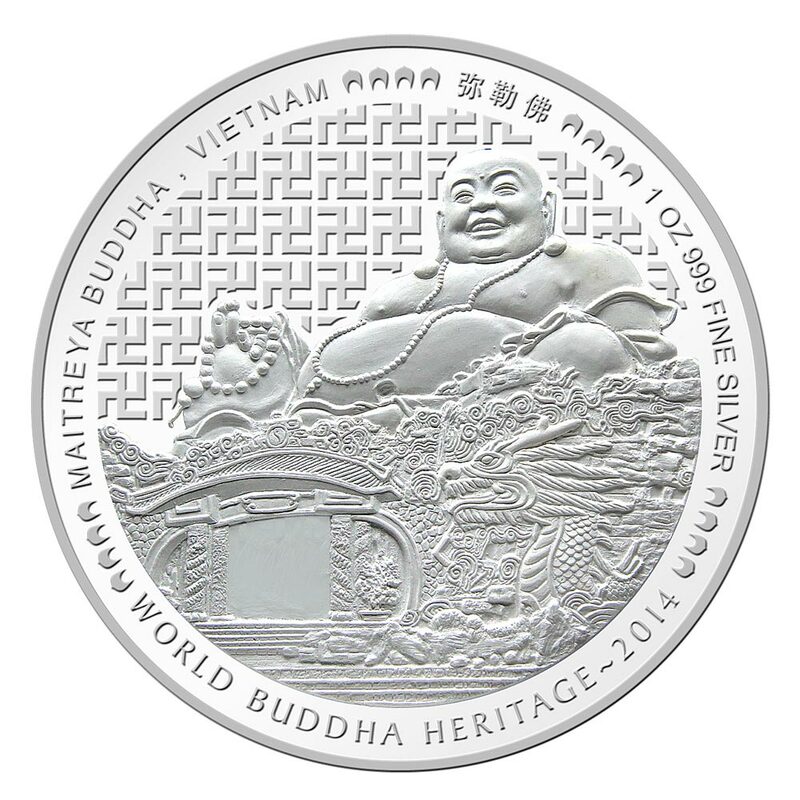 A 5oz silver coin carrying a gilded high relief reverse was released with an obverse depicting all of the eight Auspicious Symbols. It and the tiny gold coins can be seen on the SPECIALS tab below. 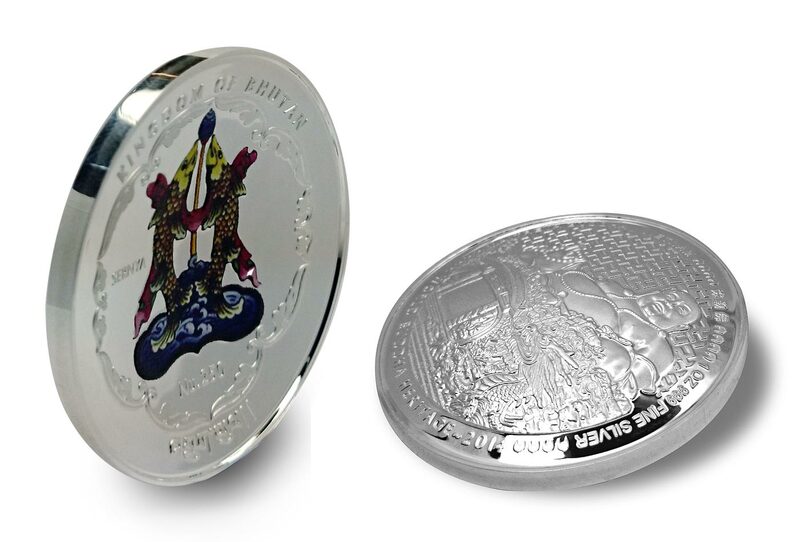 They are minted and distributed by The Singapore Mint and each coin comes in an elegant display box with a Certificate of Authenticity. Angkor Archaeological Park, located in northern Cambodia, is one of the most important archaeological sites in Southeast Asia. Located six kilometers north of Siem Reap, Angkor Wat is one of the largest of Khmer monuments. Built around the first half of 12th century by King Suryavarman II, the temple’s balance, composition and beauty make it one of the finest monuments in the world. uilt in the latter part of the 12th century by King Jayavarman VII, Bayon is one of the most widely recognised temples in Siem Reap because of the giant stone faces that adorn the towers of Bayon. There are 54 towers of four faces each, totaling 216 faces. Seokguram is an artificial stone temple made of granite, and is located on the eastern peak of Mt. Toham. It contains a monumental statue of the Buddha looking at the sea in the bhumisparsha mudra position. With the surrounding portrayals of gods, Bodhisattvas and disciples, all realistically and delicately sculpted in high and low relief, it is considered a masterpiece of Buddhist art in the Far East. The Temple of Bulguksa (built in 774) and the Seokguram Grotto form a religious architectural complex of exceptional significance. The main Sakyamuni Buddha figure is 3.45 m high, and set on a lotus flower-shaped pedestal. The hair is tightly curled and there is a distinct usnisa, the protuberance on the top of the head symbolizing Supreme Wisdom. 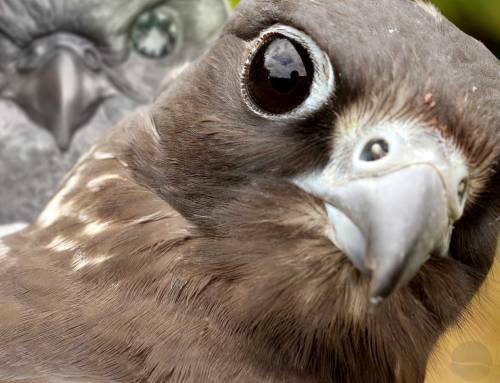 Beneath the broad forehead the eyebrows are shaped like crescent moons and the half-closed eves gaze towards the East Sea. The Buddha’s robe is slung over the right shoulder; the details of the robe covering the left arm and chest are realistically depicted. The Buddha is portrayed cross-legged with the hands in the bhumisparsha mudra position, the gesture with which the historical Buddha summoned the Earth as witness to his realization of Enlightenment. The white conch which coils to the right symbolises the deep, far-reaching and melodious sound of the Dharma teachings, which being appropriate to different natures, predispositions and aspirations of disciples, awakens them from the deep slumber of ignorance and urges them to accomplish their own and others’ welfare. Wat Pho (the Temple of the Reclining Buddha) it’s the largest temple in Bangkok and famed for its huge and majestic reclining Buddha. The Vihara of the Reclining Buddha or Phra Buddhasaiyas (Viharn Phranorn), the building is constructed for containing the important Buddha image, the Reclining Buddha. King Rama III told his nobleman, Krom Muen Pumintarapakdi (Prince Laddawan), the head of department of the Ten Crafts as a construction team leader. After having noulded the image of the Reclining Buddha, the team continued with the hall.The image was made of stuccoed bricks gilded with gold leaves. This statue is 46 metres long, with the dimensions at the face of 15 metres high and at each foot of 3 metres high and 5 metres long. The soles of the statue’s feet are inlaid with mother-of-pearl showing the 108 auspicious signs (laksanas) of the Buddha. This is the largest and most beautiful piece of fine arts of the Buddha image in a reclining position found in Thailand. The mother of pearl inlay at the feet of the image is of Thai-Chinese style, as indicated by 108 auspicious signs portraying natural scenes of both Indian and Chinese influences. On the inner wall of this vihara, you will see mural paintings of three topics: “Mahawong” (Historical annals of Ceylon) up the windows; “13 Savida Atadagga Disciples (Priestess)”, “10 Upasaka Atadagga Disciples” and “10 Upasika Atadagga Disciples” between each window. The Leshan Giant Buddha is a statue of Maitreya (a Bodhisattva usually represented as a very stout monk with a broad smile on his face and with his naked breast and paunch exposed to view) in sitting posture. The Buddha is located to the east of Leshan City, Sichuan Province, at the confluence of three rivers, namely, Min River, Qingyi River, and Dadu River. The statue makes itself the most renowned scenic spot in Leshan City. In December, 1996, the location of the Buddha was included by UNESCO on the list of the World Heritage sites. Begun in the year 713 in the Tang Dynasty, and finished in the year 803, the statue took people more than 90 years to carve. 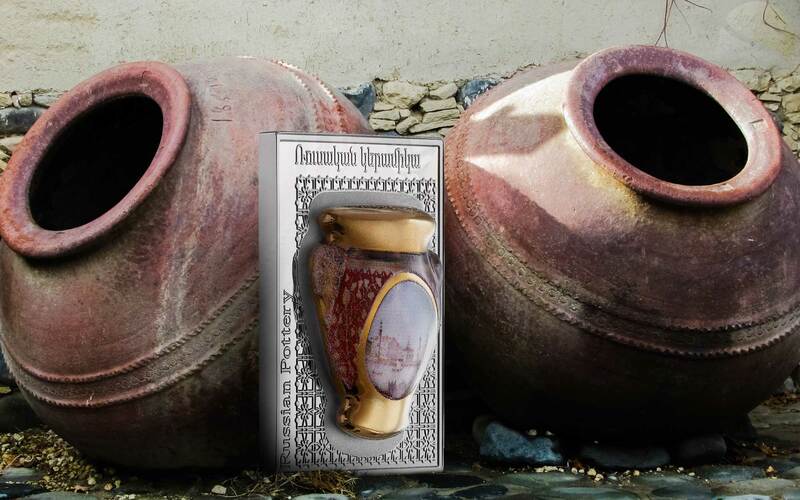 During these years, thousands of workers had expended their efforts and wisdom on the project. As the biggest carved stone Buddha in the world, Leshan Giant Buddha is featured in poetry, song and story. The golden wheel symbolises the auspiciousness of the turning of the precious wheel of Buddha’s doctrine, both in its teachings and realizations, in all realms and at all times, enabling beings to experience the joy of wholesome deeds and liberation. The Mahabodhi Temple, a UNESCO World Heritage Site, is a Buddhist temple in Bodh Gaya, marking the location where Siddhartha Gautama, the Buddha, is said to have attained enlightenment. Bodh Gaya (located in Gaya district) is located about 96 km (60 mi) from Patna, Bihar state, India. Next to the temple, on its western side, is the holy Bodhi tree. 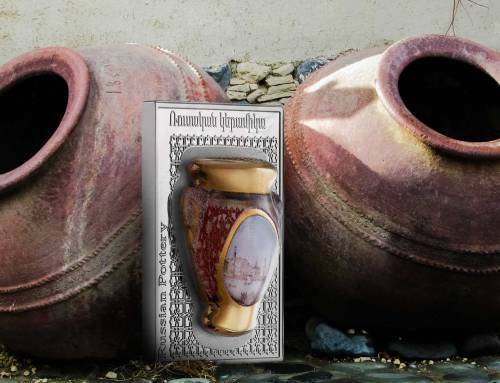 In the Pali Canon, the site is called Bodhimanda, and the monastery there the Bodhimanda Vihara. The tallest tower is 55 metres (180 ft) tall. The Vault of Mahabodhi Temple is being coated with Gold plates weighing 290 kg by the Government of Thailand. The Thousand-hand Guanyin is one of six Guanyin Buddhist gods. With regard to the origins of this Bodhisattva, the civil is circulating a moving story. It’s said that in an ancient Country there was a Miaozhuang king who had three beautiful princesses, Miaojin, Miaoyin, and the little daughter Miaoshan. The elder two were at home to serve their parents; only Miaoshan was devoted to Buddha, and later became a nun. 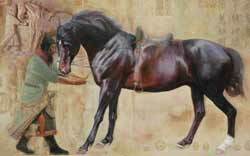 Her father Miaozhuang King tried so hard to persuade her back, but she always refused. In such a fury, Miaozhuang King sent his warriors to pull down the temples and expelled all the nuns. The activity, unexpectedly, was blamed by the god in heaven, who casted 500 incurable large abscess onto the body of Miaozhuang King. The King hence suffered a lot until finally, a witch appeared said that the disease can be cured via one and only one method, that he must dose a co-drugs mixed the hand and eye of his flesh and blood. 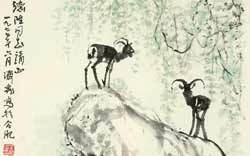 As a result, the father had recourse to Miaojin and Miaoyin, but the two princesses were not willing to devote. 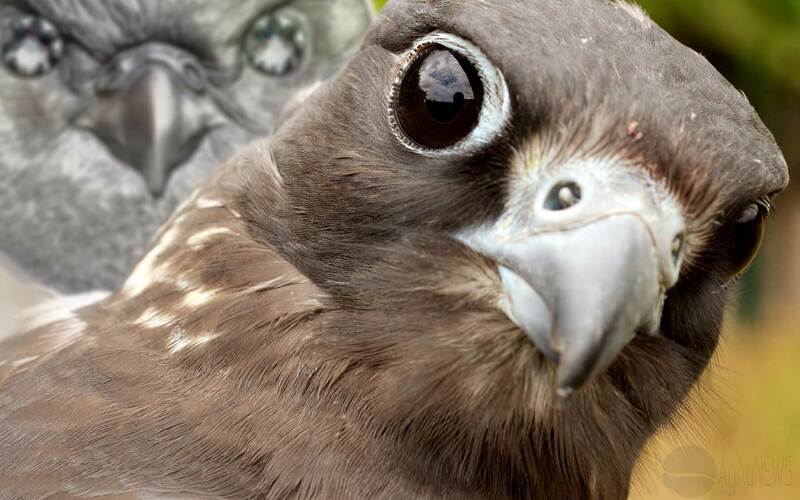 Miaoshan, however, resolutely sacrificed her hand and eye when heard about the things. Sure enough, Miaozhuang King recovered shortly. Miaoshan’s behavior not only gave a good lesson to Miaozhuang King, but also moved greatly Sakyamuni, the highest lord of Buddha. 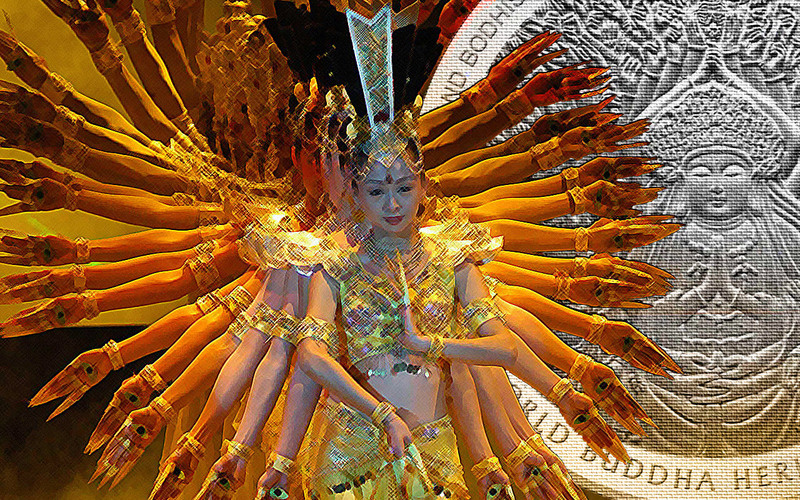 The little princess was bestowed with one thousand hands each with an eye in the palm, and awarded the name Thousand-hand Guanyin Bodhisattva. Sitting comfortably over an expanse of lush greenery on Cam Mountain peak of Vietnam, the Maitreya Buddha wears a merciful smile atop the idyllic mount. 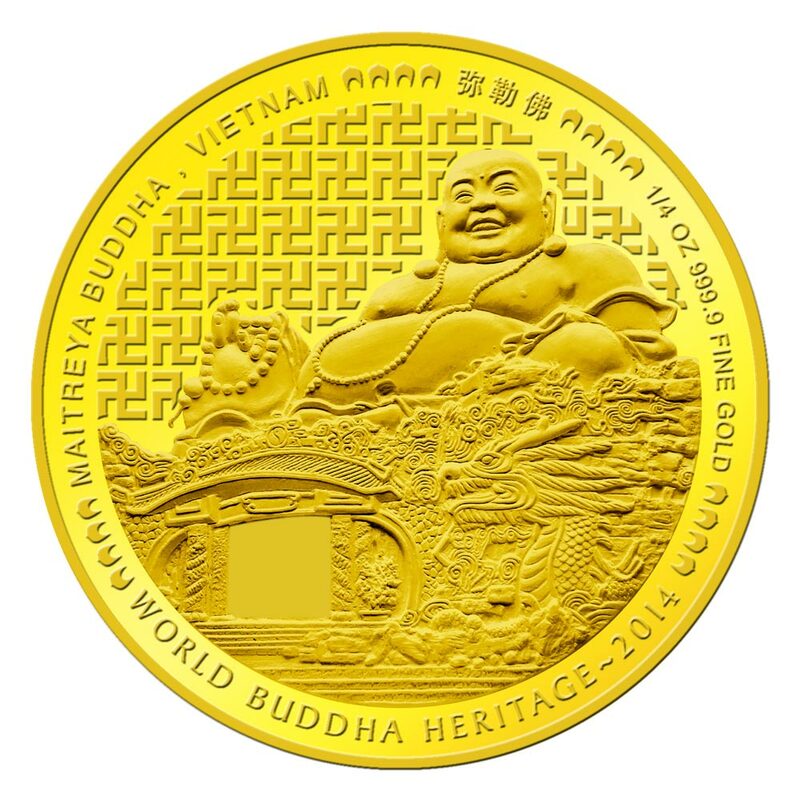 Weighing 600 tons and reaching to a lofty height of 33.6m, the Maitreya Buddha statue featured in this 7th coin of the World Buddha Heritage series is Asia’s largest. Commonly referred to as the Laughing Buddha, the Maitreya Buddha is a bodhisattva who is to appear on Earth, achieve complete enlightment and provide teaching to mankind in the future, thus being recognised the Buddha of the Future, a successor to the historic Sakyamuni Buddha as according to Buddhist scriptures. 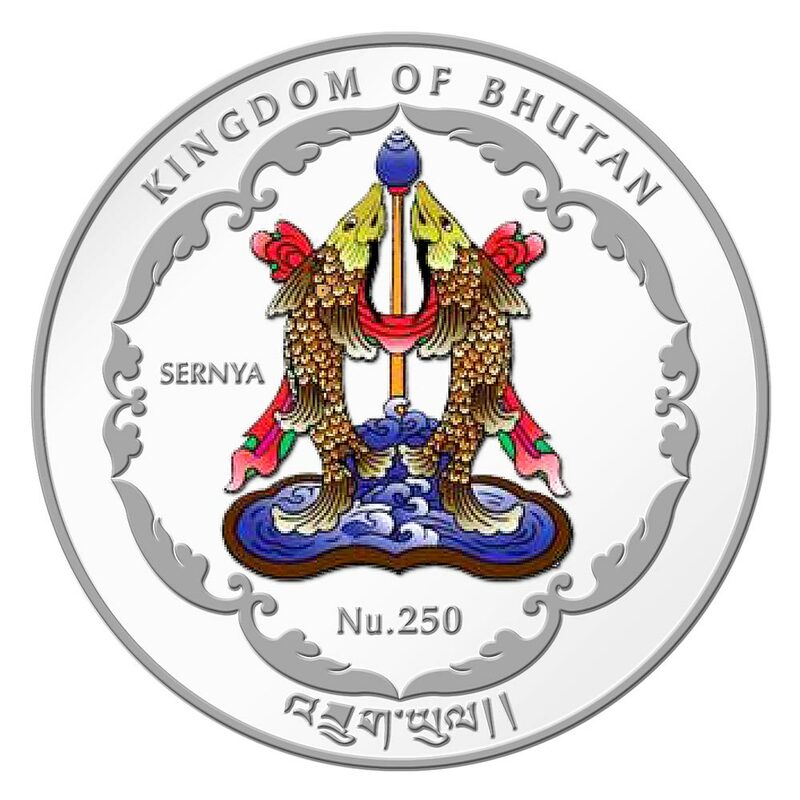 The pair of fish featured on the coin reverse is Sernya – one of the 8 auspicious elements in Buddhism. Sernya signifies the liberation of trappings, rebirth and resurrection of eternal life, like the fishes’ ability to swim freely in the ocean. Similarly, the ability of fishes to see through muddy waters, symbolizes clarity in the perception of matters. In the centre is a depiction of the golden fish that symbolises the auspiciousness of all living beings in a state of fearlessness, without danger of drowning in the ocean of sufferings, and migrating from place to place freely and spontaneously, just as fish swim freely without fear through water. 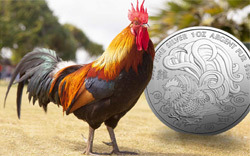 On the silver coin this is coloured. At top is the inscription ‘KINGDOM OF BHUTAN’, at bottom the denomination, and at right is inscribed the auspicious symbol name ‘SERNYA’. 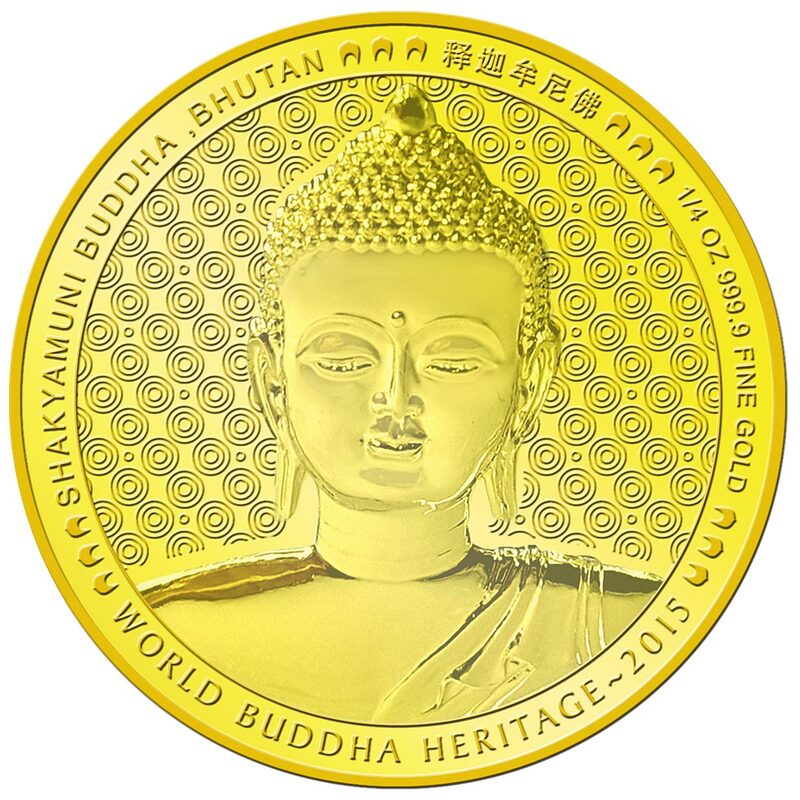 A fitting conclusion to the World Buddha Heritage series, the Shakyamuni Buddha from the Kingdom of Bhutan, the issuing country of this coin series, is specially selected to feature in the final coin issue. This magnificent statue of the Shakyamuni Buddha sits atop a hill, overlooking the Southern entrance to Thimpu Valley of Bhutan. At a towering height of 51 metres, the Shakyamuni Buddha of Bhutan is a bronze statue gilded in gold, seated on a 20m throne under the Buddha Dordenma project. This Buddha statue enshrines a total of 125,000 smaller Buddha statues within the body and the throne. The Urna in between the eyebrows of the Shakyamuni Buddha, also known as the Third Eye, symbolizes the Eye of Wisdom that sees unity. It is made up of 1000 carat diamonds mounted with diamond holders made of 10 kg of 18K gold. Inspired by the Buddha’s tight ringlets of hair on the head on the head, an intricate pattern of circular ringlets lightly engraved behind the Shakyamuni Buddha forms the background of the coin obverse, representing life between the extremes of indulgence and mortification. Each feature and contour of the Shakyamuni Buddha has been meticulously engraved to highlight his divine proportions as the vivid Shakyamuni Buddha smiles faintly with his eyes half-closed. 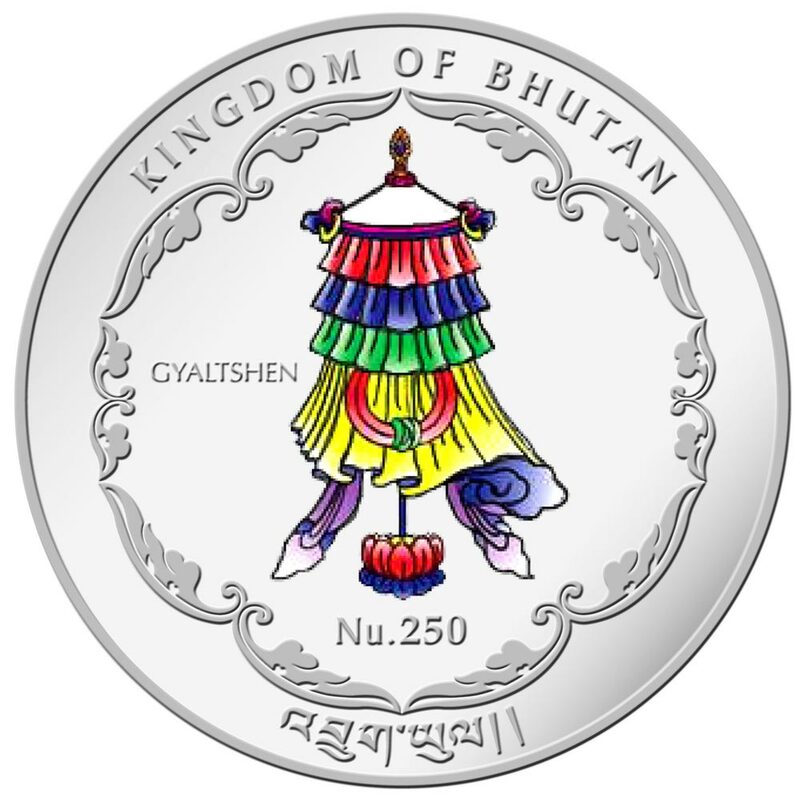 The victory banner featured on the coin reverse is Gyaltsen – one of the 8 auspicious elements in Buddhism. Gyaltsen signifies the victory of the Buddha’s teachings over death, ignorance, disharmony and all obstacles and negativities. 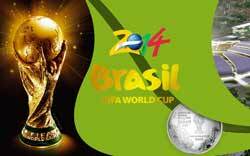 It also symbolizes the victory of good over the evil forces which interferes the success of noble goals. 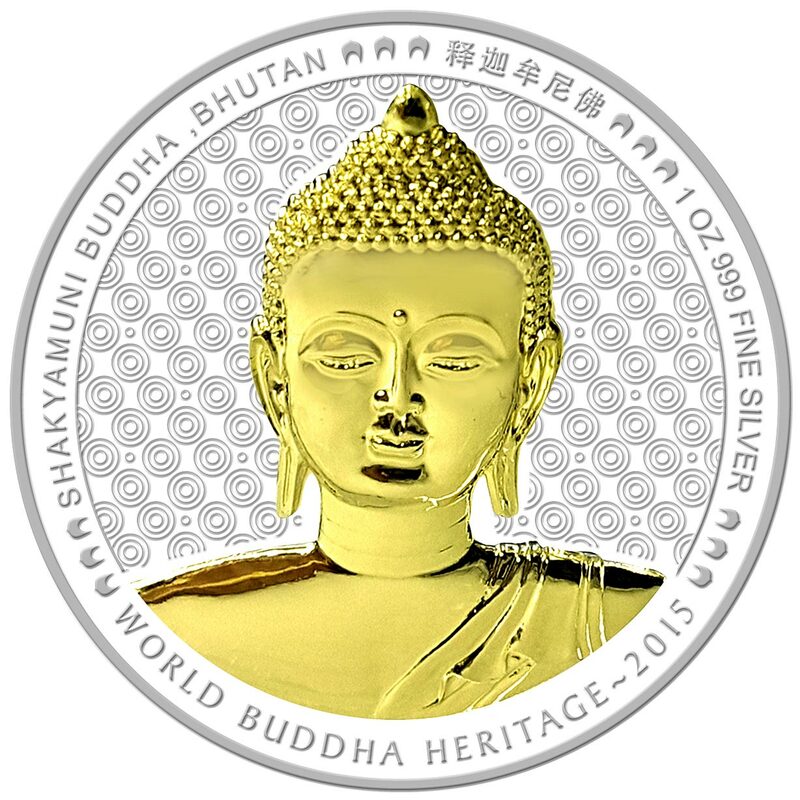 In this final issue of World Buddha Heritage Series, an exquisite 5 oz fine silver coin is specially issued by the Royal Monetary Authority of Bhutan to commemorate the conclusion of the series. 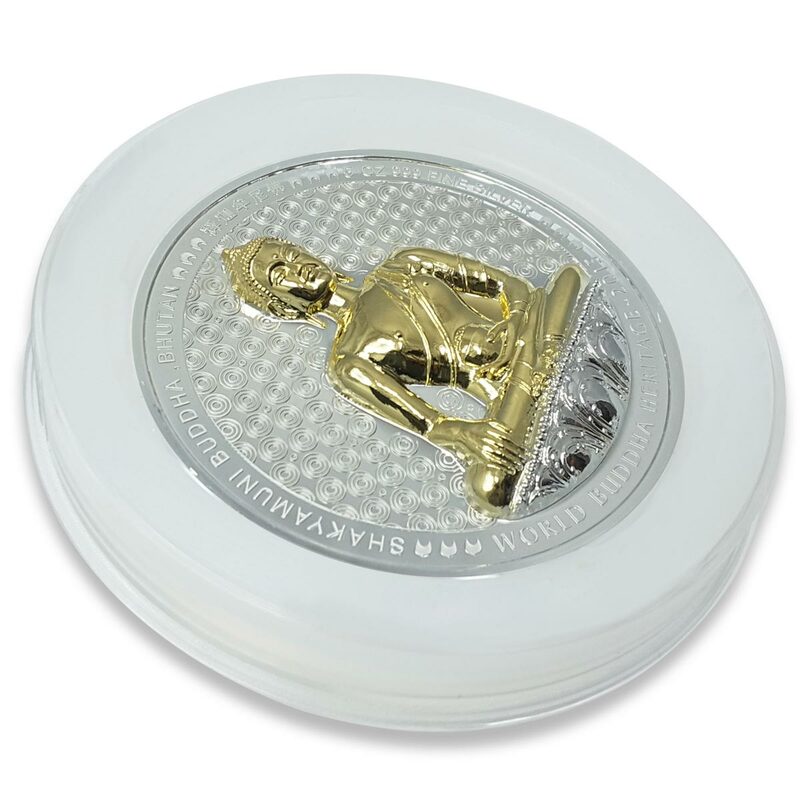 Featured in this stunning 5oz fine silver coin is the spectacular full-body statue of the Shakyamuni Buddha minted with ultra-high, gold-gilding relief that aptly captures the spiritual essence of the Buddha’s enlightenment to bestow blessings, peace and happiness to the world. The vivid three-dimensional Shakyamuni Buddha sits peacefully on the lotus throne, with his right palm resting on the right knee, extended to the earth and his left hand holding an alms bowl on his lap, palm skywards. Placed in front of him is a five-pronged Vajra with lotus-shaped ends, known as a symbol of Full Knowledge in Buddhism. Each feature and contour of the Shakyamuni Buddha has been meticulously engraved and artfully gilded to highlight his divine proportions. An intricate pattern of circular ringlets lightly engraved behind the Shakyamuni Buddha forms the background of the coin obverse. Inspired by the Buddha’s tight ringlets of hair on the head, it represents life between the extremes of indulgence and mortification. 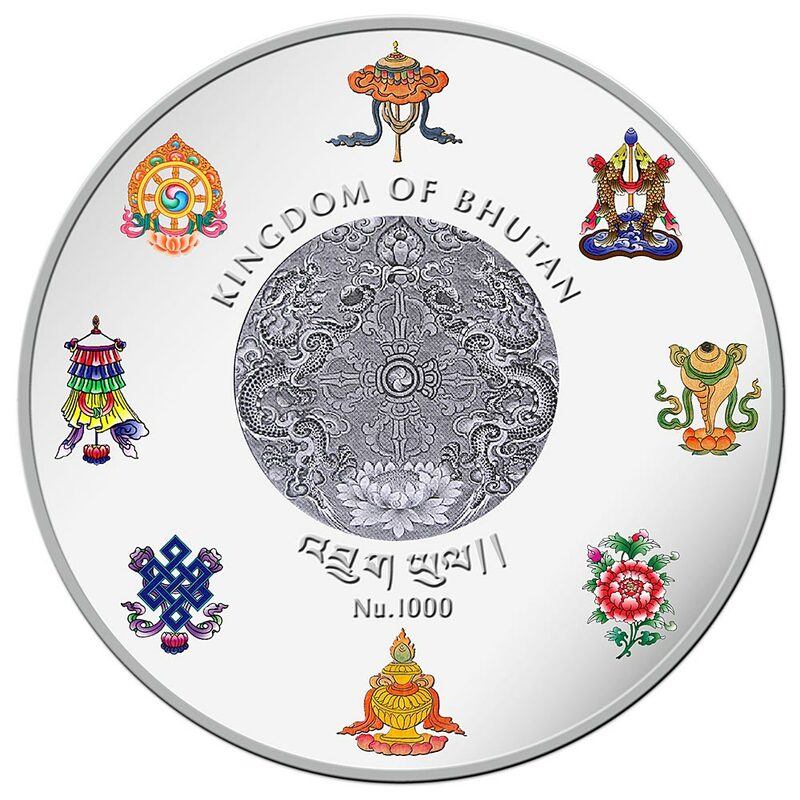 In the center of the 5oz coin reverse is the elaborate engraving of the national emblem of the Kingdom of Bhutan. The outer ring features the 8 Auspicious Symbols of Buddhism – Bumpa (Treasure Vase), Dungkar (Conch Shell), Dhug (Parasol), Khorlo (Dharma Wheel), Meto Pema (Lotus), Palbheu (Endless Knot), Sernya (Golden Fish) and Gyaltsen (Victory Flag) – that were individually featured in the 8 issues. 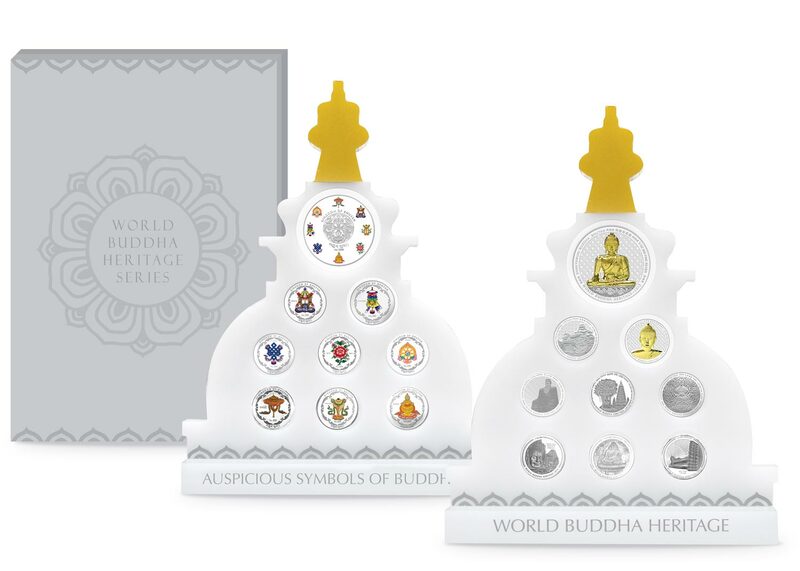 Each symbol represents an aspect of Buddhist teaching, and it is believed that having all Eight Auspicious Symbols together can bring peace and harmony to one’s life, a fitting finale special issue to the World Buddha Heritage series. 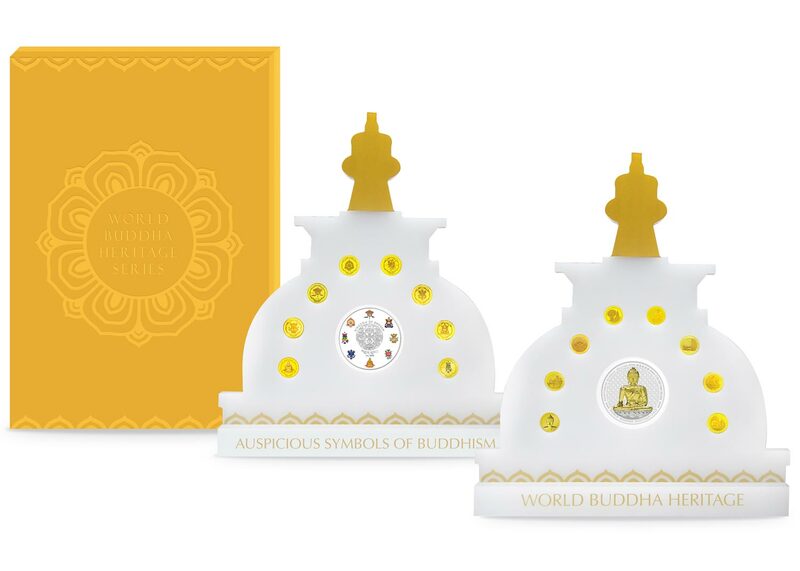 An exceptional 9-in-1 gold round-up set released by the Kingdom of Bhutan commemorates the final issue of the World Buddha Heritage series. 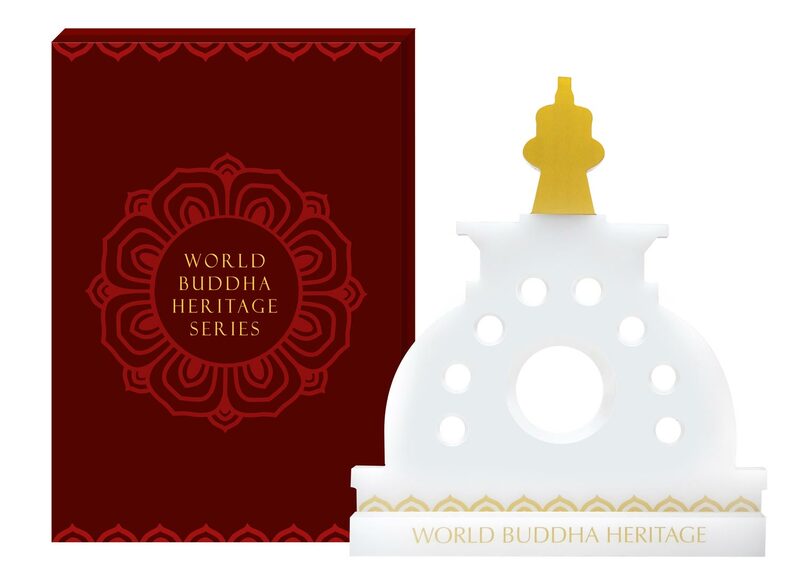 The gold set consists of 8 pieces of 1/4oz 999 fine gold coin and a 5oz 999 fine silver commemorative special, housed in an elegant Stupa display. 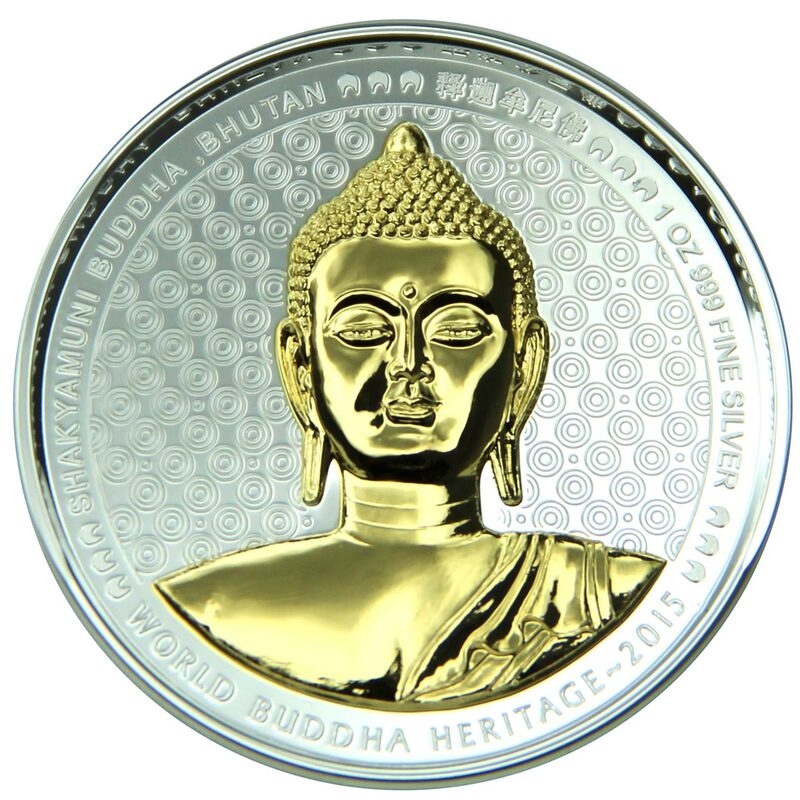 The silver set consists of 8 pieces of 1oz 999 fine silver coin and a 5oz 999 fine silver commemorative special, housed in an elegant Stupa display. Also included in each set is the Certificate of Authenticity as well as the heritage information of all the coin designs, collated into mini booklet. 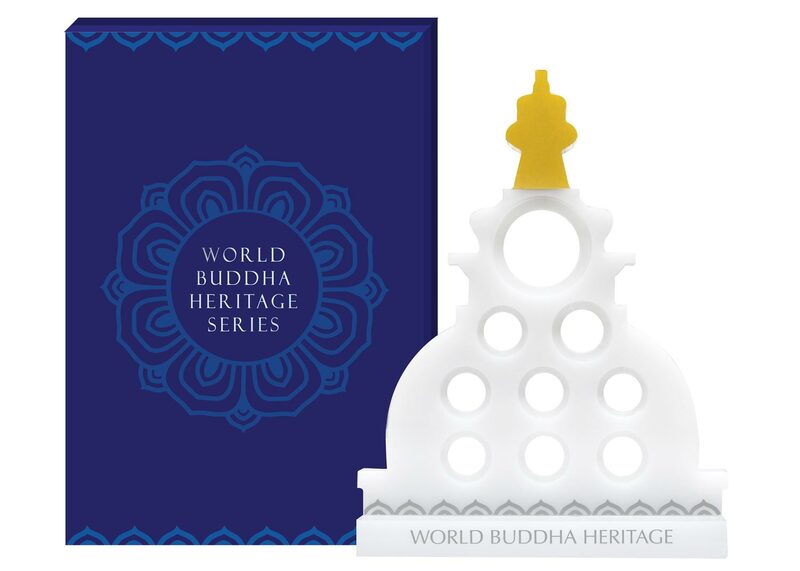 The Stupa-shaped acrylic display is an architectural representation of the Buddhist path to enlightenment. 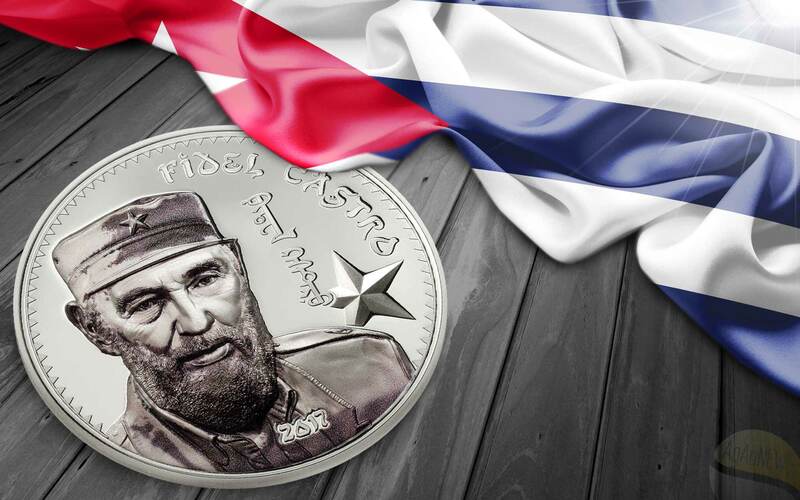 Interplay of transparent and frosting effect on the high quality acrylic and special through-hole coin holding, allows both sides of the coins to be showcased at the same time. Together with ornate silver printed lotus petals lining the base, the entire coin set will make for a classy and decorative display piece for any space. 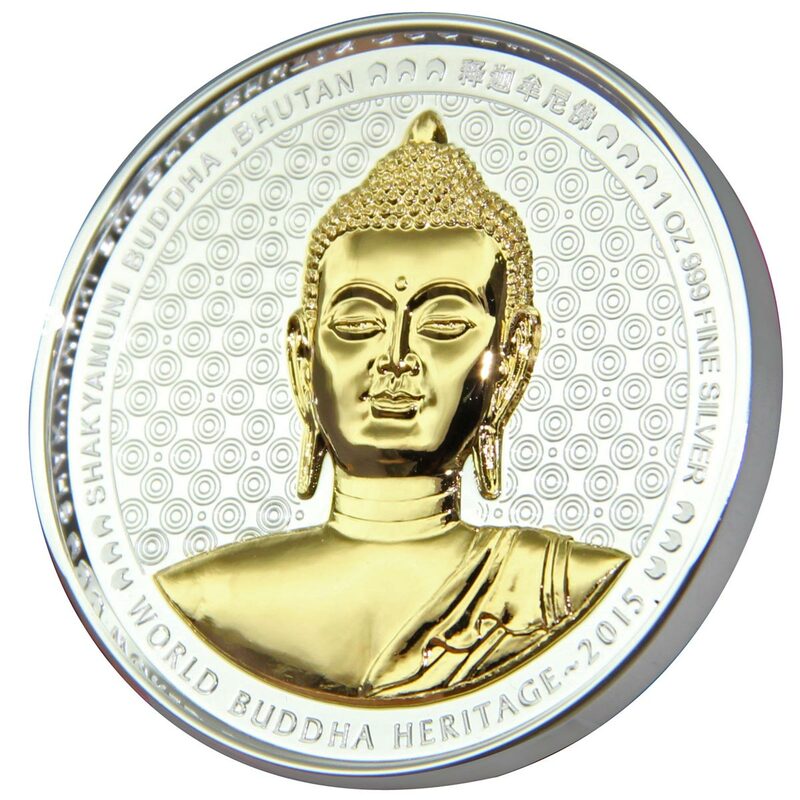 Each issue highlights a renowned Buddha statue or Buddhist monument on the obverse to celebrate the rich history of Buddhism around the world. The series features the following Buddhist statues and monuments: Four-faced Buddha of Cambodia, Seokguram Grotto of Korea, Wat Pho of Thailand, Leshan Giant Buddha of China, Mahabodhi Temple of India, Thousand-Hand Bodhisattva of China, Maitreya Buddha of Vietnam and Shakyamuni Buddha of Bhutan. 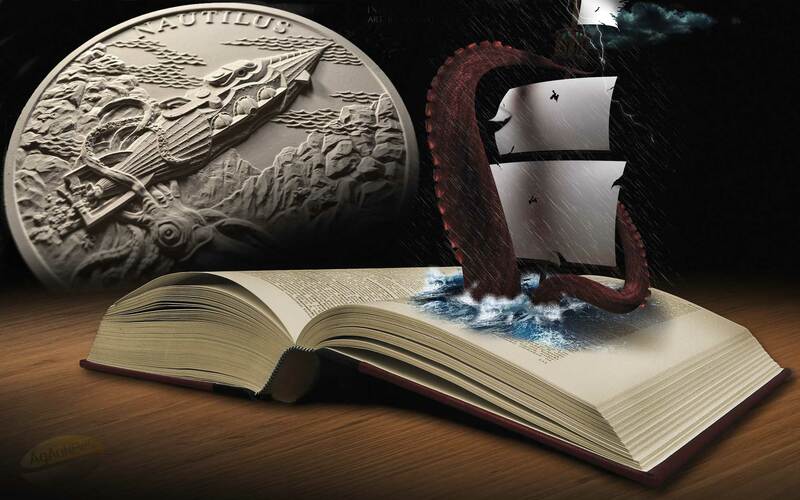 While the coin reverse features the Eight Auspicious Symbols – one symbol for each issue. Each symbol represents an aspect of Buddhist teaching and is believed to bring great blessings to people. 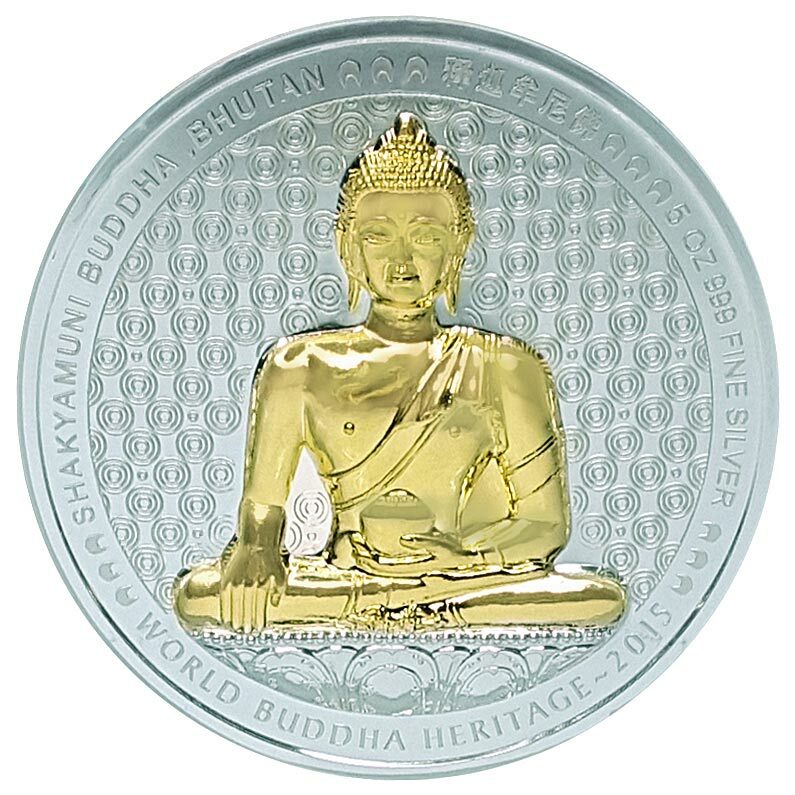 Featured in this stunning 5oz fine silver coin is the spectacular full-body statue of the Shakyamuni Buddha minted with ultra-high, gold-gilding relief of approximately 4.5mm that aptly captures the spiritual essence of the Buddha’s enlightenment to bestow blessings, peace and happiness to the world. 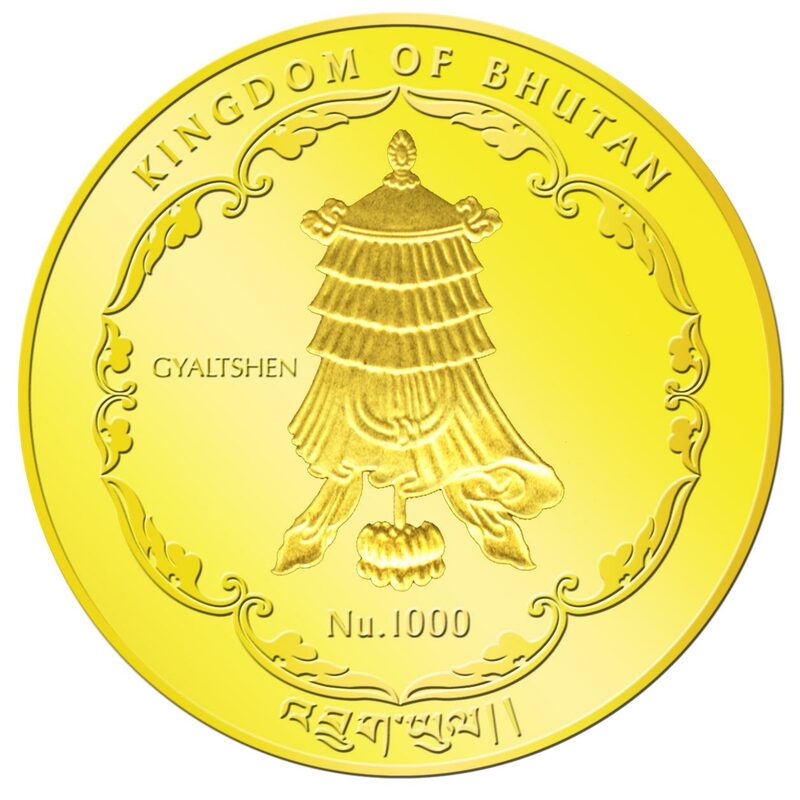 The reverse side features the elaborate engraving of the national emblem of the Kingdom of Bhutan and all Eight Auspicious Symbols together. 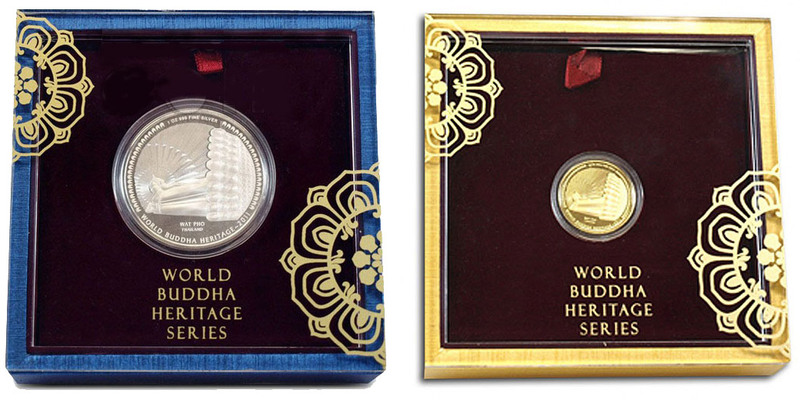 The 9-in-1 coin set is packaged in a stylish 2 piece packer box with lotus flower motif and emblazoned with glossy hot-stamping lettering of “WORLD BUDDHA HERITAGE SERIES”. For those that have been collecting the series over the last few years, the boxes are available seperately for S$90 each. Each individual coin over the years has been packaged in the boxes shown below.